So recently I decided to make a little better use of my money in the bank. As I mentioned sometime ago in one of my Facebook updates, Make Money Work For You, Not the Other Way Around, I thought that was one way of how we should manage our money. I have been a faithful customer of Maybank all this while, but sadly they do not offer much incentives for people who do keep their savings in their bank. Much less a cash rebate incentive when using their Maybank Platinum MasterCard Debit. The best Credit Card from Maybank however is their Maybankard Two duo of Amex with 5x points and 5% cash back on weekends, and Visa/MC partner. But that is saved as an entry for another day. 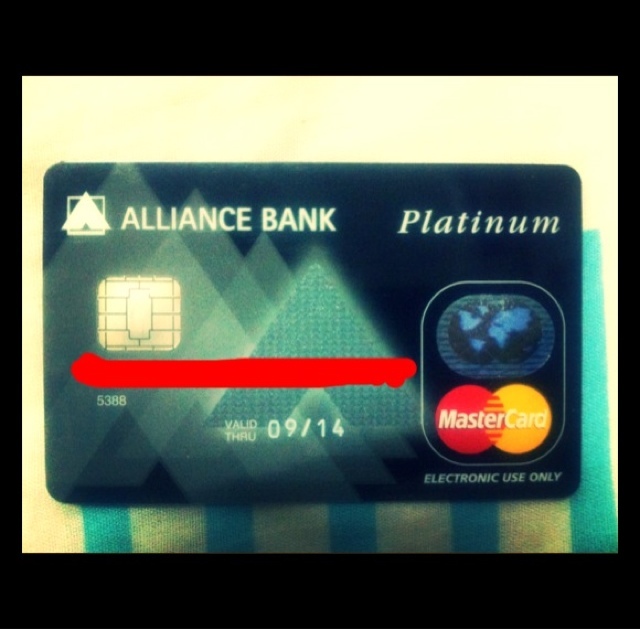 that this is so far one of the best cash rebate debit bank cards out on the market. It turns out there are three categories with the debit cards that come linked to the Alliance Bank Hybrid accounts. It is called a Hybrid Account as it is neither a savings or Current Account, but is both. The first category: is the normal ordinary account which comes with a minimum deposit of 1% cash back. There is no qualifying criteria for this. - Rebate is up to a maximum spending of Rm3,000 per month. The second category is the Platinum Debit with a 1.5% cash back rate. This card is available with a minimum opening deposit of Rm20,000. - Rebate is up to a maximum spending of Rm6,000 a month. The third category is the Premium Debit with a 2% cash back rate. This card is available with a minimum opening deposit of Rm200,000. - Rebate is up to a maximum spending of Rm9,000 a month. The annual fee for all cards is Rm12. - pay Rm12 for the annual fee. The rest will be done by the officer at the teller. The entire procedure took less than 30 minutes. Anyways, my main concern with using a MasterCard or Visa Debit that is directly linked to an account that keeps money is that unfortunately with accounts these days, anyone can pick up a card and use it even without needing a signature. The officer told me I can sign up for eFixed Deposit account when the Internet Banking is up and running. Alliance Bank has two categories of privilege banking relationship with customers that is namely, Alliance Personal (deposits up to Rm50,000), and Alliance Premier (deposits up to Rm200,000). Granted, Alliance Bank is a much smaller bank than Maybank and CIMB with less bank branches. Their branch in Mega Mandung is quite small, so I do believe that is why the bank needs to work harder to create more financial incentives to attract new customers.